The Empire Strikes Back has been voted greatest movie of all time in a new poll from Empire magazine. The original Star Wars clocks in at #6, Return of the Jedi is #120 and Revenge of the Sith is #224. Last time they did the poll, in 2008, Empire came in third, behind The Godfather and Raiders of the Lost Ark. This time, The Godfather slips to #2 and Raiders fell from #2 to #9. Harrison Ford had an AMA on Reddit this afternoon as part of the promotion for the Showtime documentary Years of Living Dangerously. This was more brief and less focused on Star Wars (and guacamole) than Mark Hamill’s a few months back, but Ford did answer several Star Wars and Indiana Jones questions. Someone said thank you for being a part of so many childhood films: Well, thank you. I really appreciate that. It’s a privilege to be able to be involved with people as talented as the people I’ve had the luck to work with, and it’s just been a great experience for me, and I’m glad that so many of the films I’ve had the luck to do were films that could be enjoyed by families together. Rumor: Does the future of Indiana Jones lay in recasting Indy? Does Lucasfilm already have a name in mind? As ‘scoops’ go, this seems pretty much a simple conclusion to draw, but for what it’s worth, Latino Review is saying that the Indiana Jones franchise will indeed take a page from James Bond and recast Dr. Jones, as was theorized back in December when the rights issue was settled. LR is saying while that Harrison Ford may do one more film as the hero, if things don’t move forward by a certain date, they may go forward with a new trilogy – and a new actor – instead. Bradley Cooper supposedly tops that Lucasfilm wish list. (That’s not a guarantee: I’m sure he’s on a lot of lists these days.) And on the writing end, The Walking Dead’s Frank Darabont – who wrote for the Young Indy series and an early version of Crystal Skull – may have pitched an idea. UPDATE #1: The folks at Slashfilm say a source tells them that this isn’t true – at least not at the moment. Due to the ridiculous rumors that keep popping up, like agents pipe dreams, I will stop commenting on our projects until I have real news. Rumor: Modelmakers at Pinewood under contract for 7 years, space booked for Indy 5? And here’s another from Den of Geek this morning, which at the very least seems/feels slightly more probable than the last one. They report that there’s been a clampdown on the Pinewood prop shop, but that the modelmakers are working on a Millennium Falcon (as frequently reported and possibly proved) and lightsaber hilts. The modelmakers also supposedly have seven-year contracts covering the new trilogy and three spin-offs. They’re also reporting that the planning office has a listing for an Indiana Jones 5, which wouldn’t be all that surprising giving Disney and Paramount’s announcement regarding the franchise in December. Disney expects to get script for Star Wars 7 in January. No budget for movie although studio wouldn't be surprised if it costs $200 million. He also reiterated that we’ll be seeing Star Wars movies yearly, which has been the plan for a while now, but has been rumored to be in doubt. Disney's Alan Horn on Indiana Jones: "We need a story." Guesses it will be another two to three years before we see a fifth movie. Graser is a reporter at Variety. Disney and Paramount have reached an agreement regarding the Indiana Jones franchise, Variety reports today. Disney retains Lucasfilm’s ownership rights but gains “distribution and marketing rights to future films.” Paramount will continue to distribute the first four films and will receive “financial participation” on future ones. 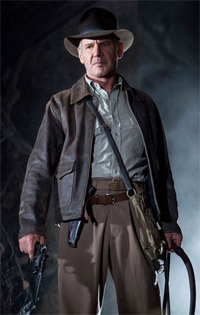 There have been rumblings of an Indy 5 since Indiana Jones and the Kingdom of the Crystal Skull came out, and actions on it have been rumored to be a part of Harrison Ford’s still unconfirmed Episode VII contract. …Only truly deranged and damaged people would take something as rich with potential as Indiana Jones and then just remake the movies that already exist. “Raiders Of The Lost Ark,” “Temple Of Doom,” and “The Last Crusade” should all be considered canon, and if you’re going to make new movies, then do it in a way that works around those films, not that tries to replace them. Could lack of Indy news in last 64 minutes signal production problems? This morning, Jedi News‘ Jedi Master SQL reports on Lucasfilm’s negotiations with Harrison Ford. A verbal agreement has been in place for him to reprise Han Solo since before the Disney deal, and the financial matters were hammered out over the summer. The sticking points were apparently Ford wanting to see Solo’s development over the full arc of the films – not just Episode VII – and a commitment for another Indiana Jones film. A multi-film deal has now been agreed on. Ford didn’t get a guarantee for Indy 5, but there will be an outline for the film by the end of 2014, with it going forward for a 2016 release if all parties agree. (Lingering question: Besides Ford himself, Steven Spielberg, and George Lucas, as in the past? Or will Lucas – and possibly Spielberg – pass the franchise on to other filmmakers, as has been done with Star Wars?) There are so many questions (Shia LaBouf and his burned bridges?) that if this is anywhere near true, I don’t expect anything Indy to be announced when Ford’s involvement in Episode VII is confirmed. Ford has been very open recently about wanting to play Indiana Jones again, but remember, all this is just rumor at this point. And yesterday, SQL pointed out that Lucasfilm named two production designers (officially) on Episode VII, a highly unusual move, and maintains that the November 11th, 2015 release date he reported earlier is still the target. NYCC namesake corner. 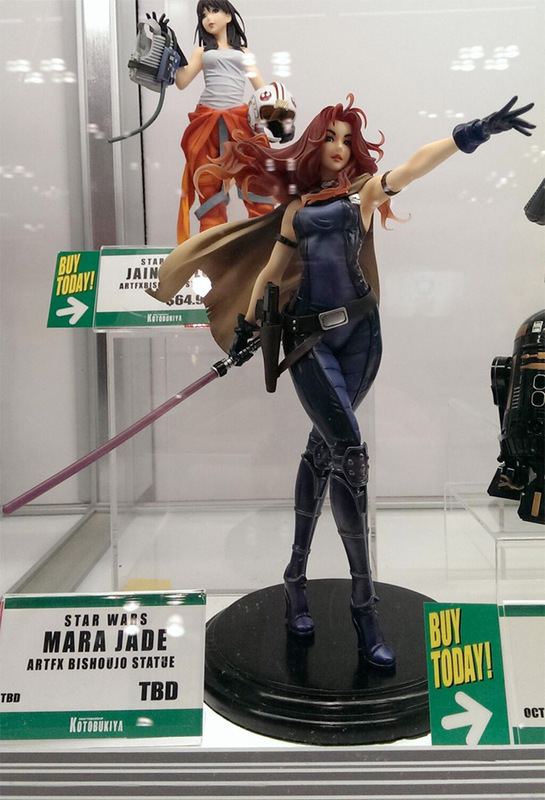 Tricia Barr nabbed a picture of the Kotobukiya Bishoujo Mara Jade on display. Thoughts? Casting. On The Graham Norton Show, Harrison Ford says he “hasn’t decided yet” about Episode VII, but he’ll return to Indiana Jones “in a New York minute.” And Michael B. Jordan tells The Huffington Post that he has indeed auditioned for the film. Your moment of zen Star Wars Joke-A-Day – perhaps better known as our own The Stooge – has hit upon a big scoop. Star Wars museum exhibits on the move! Already thinking about travel plans for the summer and rest of 2013? The traveling museum exhibitions for Star Wars and Indiana Jones are! Announced on Thursday with Billy Dee Williams on hand with the mayor of San Jose (yes, San Jose! ), alongside Pablo Hidalgo and members of the 501st and Rebel Legions, San Jose’s Tech Museum of Innovation will be hosting the final stop of the Star Wars: Where Science Meets Imagination exhibition from October to next February. The exhibition has been traveling around the US since 2005 (see my pictures from when it was at Santa Ana’s Discovery Science Center), and is currently wrapping up its stay at the Orlando Science Center (ends April 7). Over the summer, it will be at the Indiana State Museum in Indianapolis (May 25 – Sept. 2). This exhibition brings out props and costumes from the Star Wars films and connects them to real world science and technology, such as space travel, prosthetics, maglevs, and robotics. Meanwhile, the Star Wars Identities exhibition, which started in 2012 in Montreal, and focuses on the concepts of identity, through origins, influences, and choices, will be ending this weekend in Edmonton’s Telus World of Science to move to Ottawa’s Canada Aviation and Space Museum from May 10 to September 2. Finally, the Indiana Jones and the Adventure of Archaeology exhibition is wrapping up its first US stay, at Santa Ana’s Discovery Science Center, closing April 21. Presented by the National Geographic Society, it highlights the real science of archaeology, and connects it to the four Indiana Jones films with both real world artifacts and movie props, costumes, and artwork. I had a chance to see the exhibition last weekend, and provided an in-depth report earlier. While I am told that this exhibition will be moving onto a new location, it hasn’t been announced yet.